The best reason to avoid buying snacks from outside is making it at home.Why there is need to fetch the silly snack packets ,if it is homemade and healthy.But many people are fond of buying it than making it at home.May be kids are resisting to eat them or those variety of available snacks are magically more convenient.At least we have to make these once in a while to get ride of those snacks. 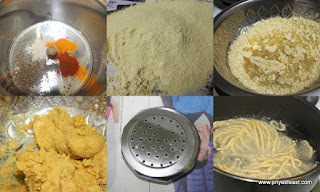 11.While serving ,crush the circular omapodi and curry leaves.So it will be very flavorful. 1.Make sure omam/ajwain is finely powdered,otherwise the dough will be blocked while pressing it.